Finestkind Scenic Cruises operates three traditional, Maine built wooden vessels which adhere not only to the strict safety standards of the U.S. Coast Guard, but to our own high standards as well. They all feature diesel engines, modern navigational and lifesaving equipment and comfortable passenger seating; under cover or in the fresh Maine air. Each vessel is tested for stability and passes a rigid inspection every season. At the end of each season the boats travel to the Finestkind Boatyard in South Harpswell, Maine where they are maintained meticulously by the staff. The boats all receive fresh coats of paint and varnish, and are stored there until they are called into service the next Spring. We take great pride in the care and maintenance of our vessels and it shows! Our newest vessel, is also our hardest working lobster boat. 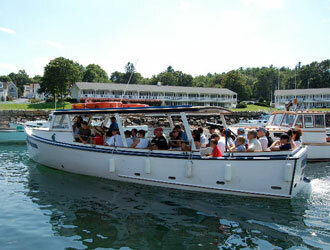 Built in 1976 in South Bristol, Maine she is thirty-six feet long and is certified to carry 37 passengers comfortably. This boat is devoted exclusively to lobstering and truly is a working lobster boat . She operates from May through mid-October and is an excellent choice for lobstering charters such as bus groups or school field trips. Considered the family favorite amongst the fleet, is our longest owned vessel. She was built in 1957 in Vinalhaven, Maine and at one time took the Hubbards on family adventures up and down the coast. As with all of our boats, she was designed with comfort and safety in mind, and has the added advantage of having open bow seating as well as seats under cover. 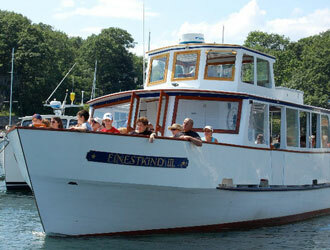 Finestkind II is 38 feet long and is certified for 43 passengers. 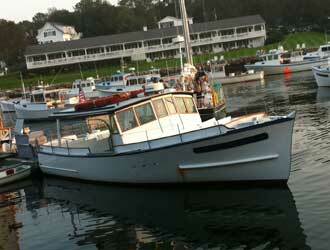 This boat’s main job is the Scenic Breakfast Cruise in July and August, but is also available for private charter. At 44 feet long, is the largest of our fleet and is certified to carry 60 passengers. 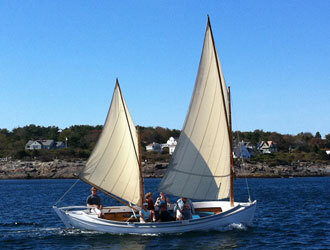 She was built right around the corner in North Berwick, Maine in 1968 and is designed purely for sightseeing. Equipped with a cash bar and washroom, this boat does trips to Nubble Lighthouse in York and scenic cocktail cruises along the Ogunquit shoreline. Finestkind III features an open foredeck and afterdeck, along with plenty of seating under cover for those who desire. This vessel is perfect for weddings and may also be chartered for funerals. This is an authentic replica of a No Man’s Land boat designed for coastal lobstering and used from around 1850-1920s, when inboard engines became available. The No Man’s Land boat has a loose footed cat-ketch sprit rig, making it smooth and easy to sail. These very stable and seaworthy vessels were common all along the New England coastline with each region having a variation on the basic theme. The hull is made of pine planks, oak frames and copper rivets and there is no engine, just two big ash oars!